Vista System International, a leading supplier of Modular Curved Frame Technology (MCFT), has recently supplied its innovative illuminated double-sided pylons to the Viennese design company Ritschi Design. 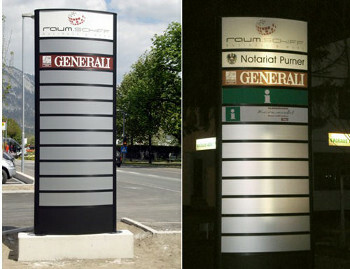 The pylons formed part of a high profile directory sign installed outside an office building in Vienna, which hosts some of Austria’s leading firms. A spokesperson for the Wicklow-based Vista said that "Raum Schiff - Business and More" who owns the building, required elegant, durable and flexible illuminated directory pylons to display the names of the companies operating within its building. The sign had to be easily updatable so that new company names could be added to the directory with ease. A further requirement was that it had to be durable to withstand the outdoor environment. Vista System's illuminated pylons were chosen because they met all the criteria. In particular, it was their ease of updating, high quality design and the fact that they can accept many types of durable graphic inserts that can withstand the outdoor environment which won out in the end. The company has a distribution centre based in Arklow, Co Wicklow.